Caterpillar Local Host Plants: Acacia auriculiformis (Leguminosae, common name: Earleaf Acacia, Black Wattle), Acacia mangium (Leguminosae, common name: Silver Wattle). 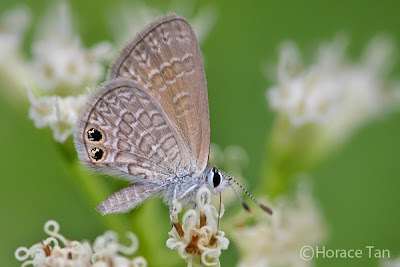 A Two-Spotted Line Blue checking out flowers of mile-a-minute in a hill park. Another Two-Spotted Line Blue on a perch under the midday sun. 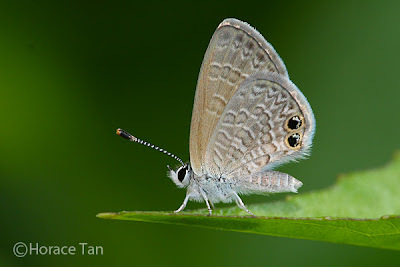 Upperside, the male is lilac with dark blue basal area while the female is dull brown with varying degree of blue in the basal area. Both sexes have two brown-black subtornal spots on the hindwing. Underside, both sexes are similarly marked. The forewing is pale orange-brown in base colour with a short band at cell-end, and a longer post-discal band, both of which are narrowly edged with brown and white. The hindwing is pale brown in base colour with a series of brown spots and bands narrowly edged with darker brown and white, and two black subtornal spots with a few iridescent green scales and ringed with pale yellow-brown. 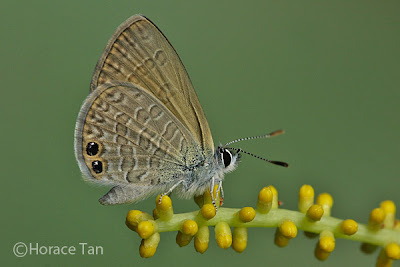 A Two-Spotted Line Blue perching on flower buds of Acacia mangium. A Two-Spotted Line Blue visiting flowers. 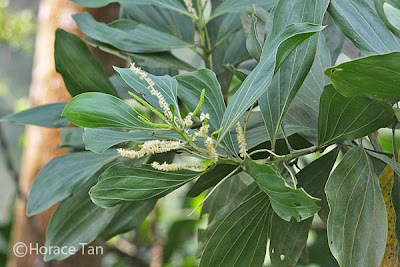 This species is Indo-Australian in origin, and was recently discovered in Singapore (see this BC blog article for details). Sightings of the tiny but usually restless adults have typically been in the vicinity of its local host plants, visiting flowers on nearby flowering shrubs or herbs. Both sexes have also been sighted, at times in large numbers, flying around or perched on inflorescence or foliage of the flowering host plants. In flight, they can easily be mistaken as other similarly-sized line blues. A definite identification can only be made when the butterfly comes to rest and allows its two trademark hindwing subtornal spots to be observed. 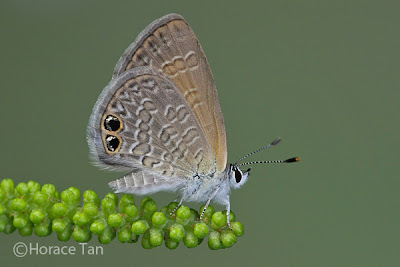 A Two-Spotted Line Blue perching on flower buds of Acacia auriculiformis. 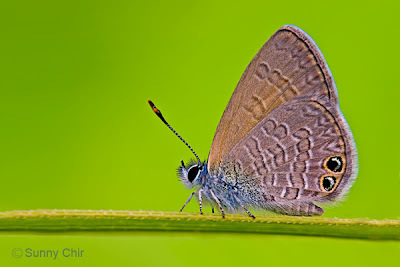 A Two-Spotted Line Blue resting on a perch. 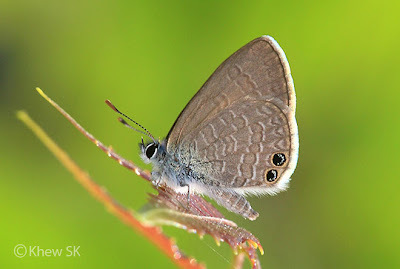 In its homeland, Australia, Two-Spotted Line Blue (TSLB) is known to be utilizing a wide range of Wattles as larval food plant. 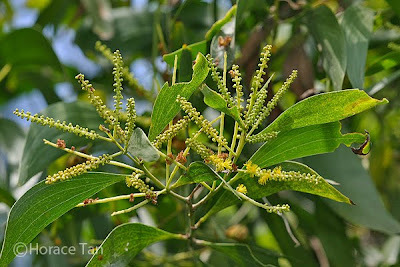 In Singapore, an invasive and naturalized Wattle, Acacia auriculiformis (the Black Wattle), is thus far the only recorded host plant. The following account of the life history of this recent addition to our checklist is based on observations made of 20 plus specimens, in varying stages of development, taken from one local host plant in two visits within a week. Another local Acacia plant, A. mangium, is listed as a host plant for TSLB in Australian literature. Hence our bred caterpillars had no problem consuming its flower buds when introduced. Caterpillars of TSLB feed on both flower buds and blossoming flowers of the host plants. Eggs of Two-Spotted Line Blue are laid singly near a flower bud on an inflorescence of the host plant. Each egg is disc-like (about 0.4mm in diameter) with a depressed micropylar. The surface is covered with a reticulated pattern of intersecting ridges and pits of varying sizes. When freshly laid, the egg is pale green. The color turns to white as the egg matures. 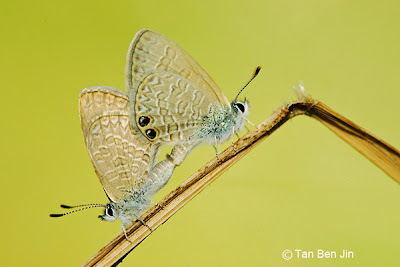 A mating pair of the Two-Spotted Line Blue. 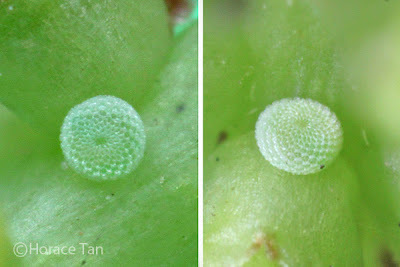 Two views of an egg of the Two-Spotted Line Blue. Diameter: 0.4mm. Each egg takes 2-2.5 days to hatch. The young caterpillar emerges after nibbling away sufficiently large portion of the egg shell. Measured at a length of about 0.7mm to 0.8mm, its pale yellow body is cylindrical in shape, wider at the anterior, and sporting two rows of long dorsal setae, and moderately long sub-spiracular setae. The head capsule is dark brown or black in color. 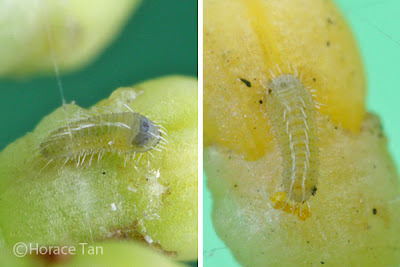 Two views of a new hatched caterpillar, length: 0.7-0.8mm. The newly hatched makes its way to a nearby flower bud and starts to munch on it. After about 2 days of growth, it reaches about 1.2mm in length and looks rather fattened. Its tiny size, matching coloration and its resting posture on the small flower buds makes it difficult for any casual observer to notice its presence. 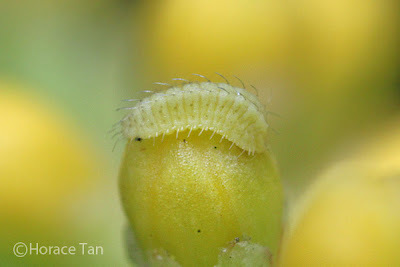 A late 1st instar caterpillar on a flower bud, dormant prior to its moult to the next instar. Still sporting the two rows of dorsal setae and sub-spiracular setae, the 2nd instar caterpillar now has numerous and very short setae covering its body surface. Its body colour is pale yellow with a green undertone. Dorsally, the body features a hump, wider at the anterior, and the two rows of dorsal setae essentially line the edges of this hump. The head capsule is still dark brown to black in colour. The growth in this stage brings the caterpillar to a length of about 2.5mm, and after about 2 days in this stage, it moults again. 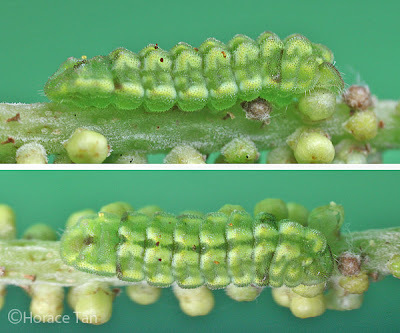 Two views of a 2nd instar caterpillar, length: 2mm. 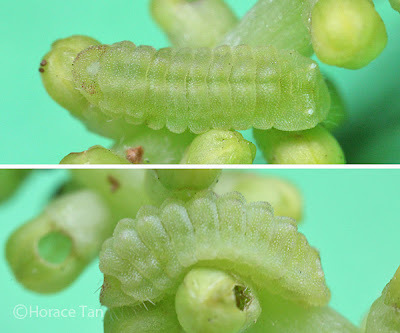 The 3rd instar caterpillar does not have the two rows of long dorsal setae as in the previous two instars. The sub-spiracular setae are still present but rather short. The dorsal hump is now marked with paler patches along the two side edges, giving the impression of a green dorsal band on the ridge of the hump. Both the dorsal nectary organ and the tentacular organs are discernible in this instar. The 3rd instar takes 2.5-3 days to complete with the body length reaching about 4-4.5mm before the next moult. In the hours leading up to the moult, a number of brown markings, which will be featured strongly in the early part of the next instar, become visible on the body surface. 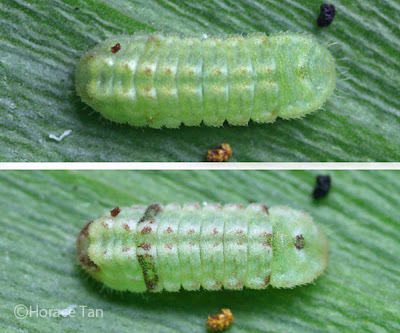 Two views of a 3rd instar caterpillar, length: 4mm. 3rd instar caterpillars. late in this stage, prior to moulting, length: 4mm. Note the appearance of brown markings. The 4th (and final) instar caterpillar has a number of brown markings on the whitish patches marking the two side edges of the dorsal hump, and more such brown markings in the sub-spiracular white patches. Brown lateral patches are found on the 1st abdominal segment. There is also a dorsal brown patch on 8th abdominal segment. The diamond-shaped prothoracic shield is white in color and embedded within a brown patch covering the entire dorsum of the prothorax. The head capsule is brown in colour. The nectary organs are rather prominent in this instar and the everted tentacular organs can be rather long (up to 1.5mm) and spectacular. See the attached youtube video (near the end of this article) of such a display. 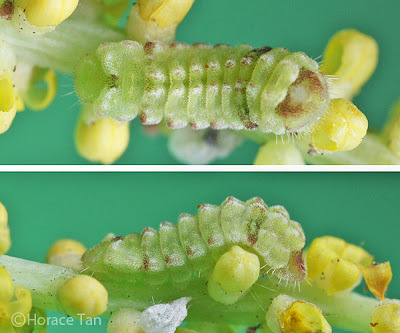 Two views of a 4th instar caterpillar, length: 5.5mm. As it eats and grows to a length of up to about 9.5mm (majority has a maximum length of about 8.5mm) within 3-4 days, the dorsal and sub-spiracular brown markings fade gradually, and the white dorsal and sub-spiracular patches becomes more intense in coloration and take on a pale yellowish tone. 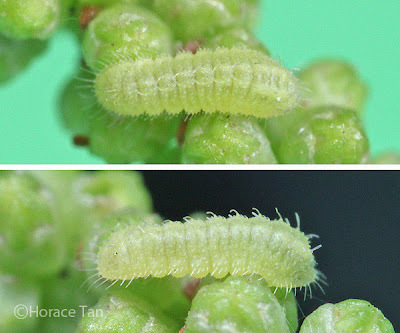 Two views of a 4th instar caterpillar, late in this stage, length: 9.5mm. On the last day of the 4th instar, the caterpillar ceases its feeding activity. Its body colour changes drastically to two extreme colour forms. In the red form, the body is mostly iridescent red while the green form mostly iridescent green. Some individuals take on an intermediate form between the red and green forms. Of the batch of 20-odd caterpillars bred, the red forms dominates and account for about 80% of all pre-pupae. At this point, the movement of the caterpillar is rather rapid as it wanders around in search of a pupation site. Three different examples lf very late final instar caterpillars, showing colour variations. In the breeding environment, the caterpillar typically chooses the tight space in a curled up leaf or the space between two leaves in a pile of leaf litter. At the chosen site, the caterpillar readies itself for pupation by spinning silk threads to secure itself and partially sealing off access point to the pupation site. 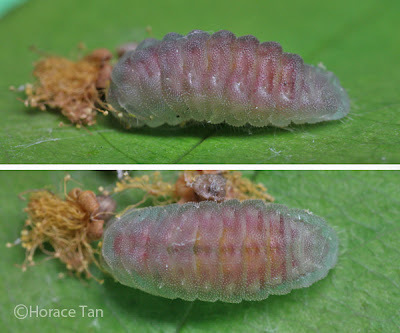 Two views of an immobile pre-pupa of the Two-Spotted Line Blue, Red form. 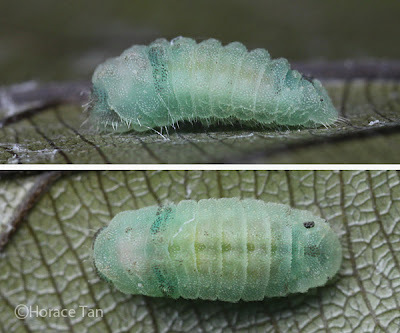 Two views of an immobile pre-pupa of the Two-Spotted Line Blue, Green form. Pupation takes place after one day of the pre-pupal stage. 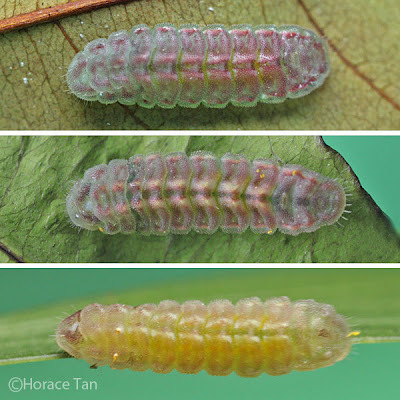 The pupa has the typical lycaenid shape, pale brown in base colour with darker brown spots and blotches which are highly variable in numbers and sizes. 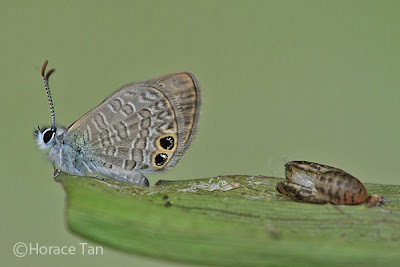 Unlike most other lycaenid pupae, the pupa of Two-Spotted Line Blue does not secure itself with cremastral hooks to any silk pad, and its posterier end does not angle downwards. 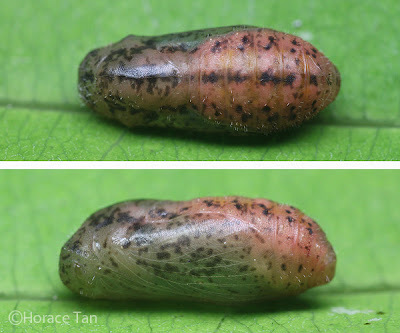 Length of pupae: 5-7mm. Four days later, the pupa becomes darkened in color signaling the imminent emergence of the adult. The next day the adult butterfly emerges from the mature pupa. 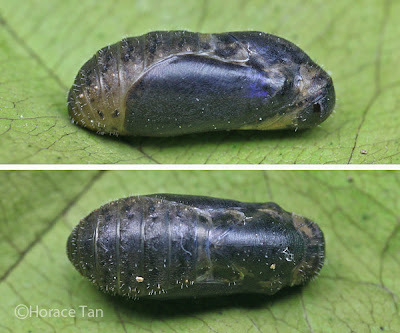 Two views of a mature pupa of the Two-Spotted Line Blue. A newly eclosed Two-Spotted Line Blue near its empty pupa case, waiting for its wings to be firmed up. 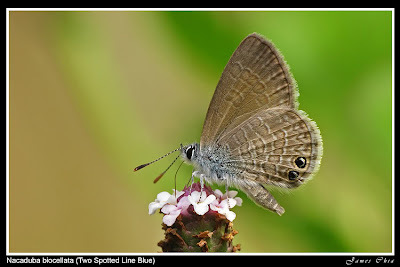 Life History of the Two-Spotted Line Blue. Butterflies of Australia: Their Identification, Biology and Distribution, Volume Two, Michael F. Brady, CSIRO Publishing. Congrats! You have worked so hard to confirm this new discovery and now we have its life history!